Assembling a marine aquarium is very simple, and contrary to what many people say, keeping it is not laborious and much less complicated. The larger the aquarium, the easier it is to keep it, because the larger volume of water gives more stability to the “mini-ecosystem”, decreasing variations in temperature, Ph, salinity etc… It also distributes the concentrations of the organic matter better, avoiding toxic levels in the most critical moments of the aquarium, when a fish dies and is not withdrawn in a short time, for example. The structure to assemble and maintain any marine aquarium basically consists of filtration, circulation, and salinity see below. The ideal is to use a circulation box (or as the North Americans say, sump), where water passes through filter elements-acrylic wool, activated charcoal, phosphate-removing resins, silicate and nitrate etc…; And where the skimmer is also placed, an auxiliary filter responsible for removing excess organic materials that can compromise the water quality of the aquarium. The circulation box is nothing more than a smaller glass box than the aquarium with some partitions to receive the filter materials, a pair of hoses or pipes to exchange water between the main aquarium and this box, and a pump powerful enough to Raise water up to the height of the top edge of the aquarium and the water returns to the box by gravity. Ideally, this pump has an effective flow of at least 10 times the volume of the aquarium in liters per hour. Example: an aquarium of 200 liters, at least one pump from a 2000 to 2500 liters per hour. There are also cute turns that are appliances developed to vary the flow of water that comes from the box in order to improve the distribution of water throughout the aquarium thus improving oxygenation and circulation. 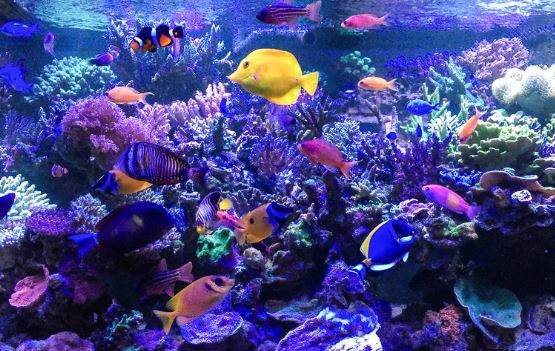 The water of any marine aquarium must be well-traveled in order to simulate the currents that reach the coral reefs, for example. For this, it is necessary to use circulation pumps inside the aquarium. All aquarium water must pass at least 10 times every hour by the bombs. That is, for an aquarium of 200 liters, at least 2 pumps of 1000 liters/hour or 3 of 700 liters/hour. Ideally, seek to direct the pumps ‘ jets to opposite directions, so that there is a better distribution of the water flow. To achieve salinity equal to that of marine water we must use the synthetic salt itself for this. Salt should be of good quality, free of nitrates and phosphates and easy and quick dissolution. The ideal density for our marine aquariums is 1,020 to 1,024 g/L. To know the water density of our aquarium we use the densimeter or a refractometer that is more accurate. The lighting of marine aquariums must be potent and selected. A coarse, simple, and efficient way to “Dosar” the light power to be installed in the aquarium is to use ½-2 watts per liter of water. Ex. Aquarium of 200 liters, should be used from 100 to 400 watts of light. The minimum of a ½ watt per liter is only recommended for the aquarium that does not intend to receive beings that depend on lots of light, as some hard corals and tridacnas. The recommended lamps are the T5 fluorescent HO and HQI ´ S. The T5 HO fluorescent tubes have two times more luminous efficiency (lumens/watts) than a normal fluorescent tube, which facilitates the installation because it allows the use of a smaller number of lamps to achieve the desired power. Previous post How am I Supposed to Feed My Fish? Next post How do The Fish Sleep?